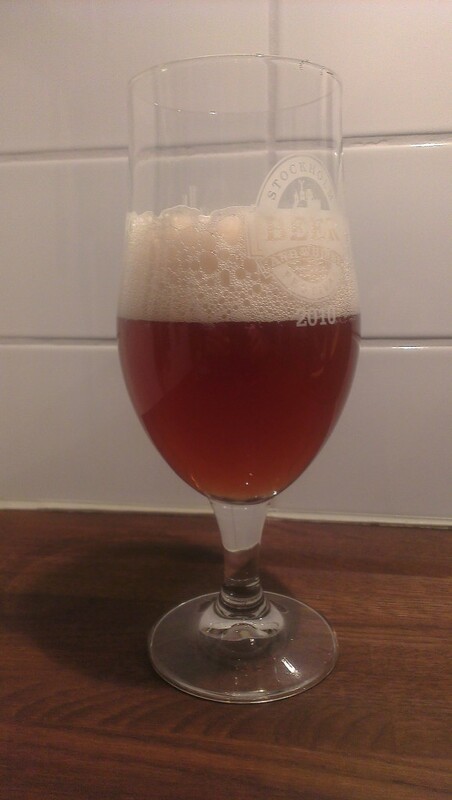 This is the first impressions of my “house APA” in batch 3, now 3 weeks on bottle. Since I haven’t written any brew report for it, here’s a run-down: It’s a 5.4% ABV single- and dry hop Amarillo on pale ale malt, Münich I and Caraamber. I want to zoom in to a light, easy to drink, Amarillo for the summer months. And I do believe I’m, getting closer. It pours hazy golden and starts with a massive 4-finger head that slowly dissipates without leaving anything on the sides. Nose is light and fresh Amarillo with hints of cookie-like Münich in the background. Light bodied and semi-dry mouth with a fresh and simple lingering bitterness. This is indeed very good. Last batch had distinct esters and not enough of a nose. So this batch I made sure to do a starter first, using White Labs California Ale WLP001, and the result is lass phenols in the nose and a lot less esters in the taste. Good! Damn, this is easy to drink! Now, pending the outcome of my Dale’s Pale Clone I might actually add some more caramel malt to the next batch, and probably even more hops late in the boil.